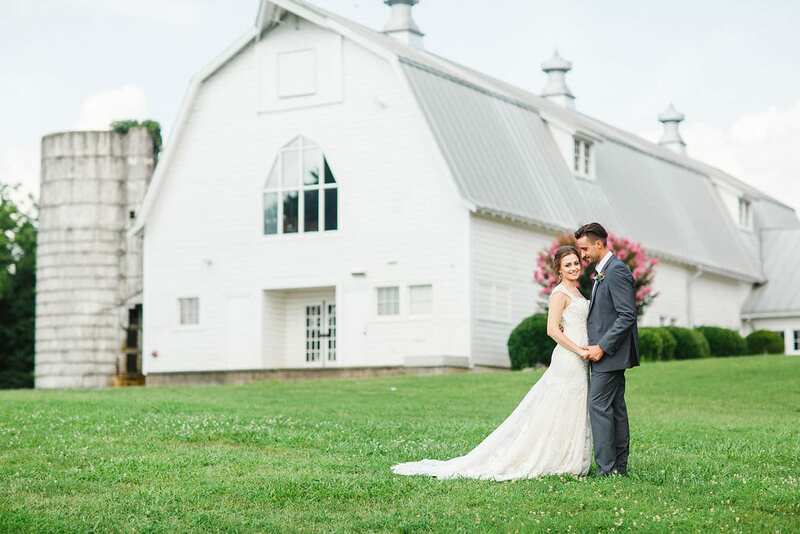 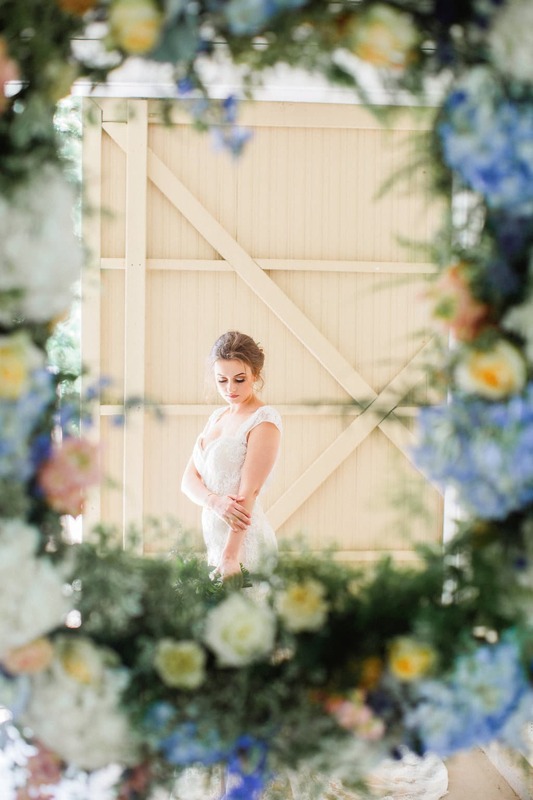 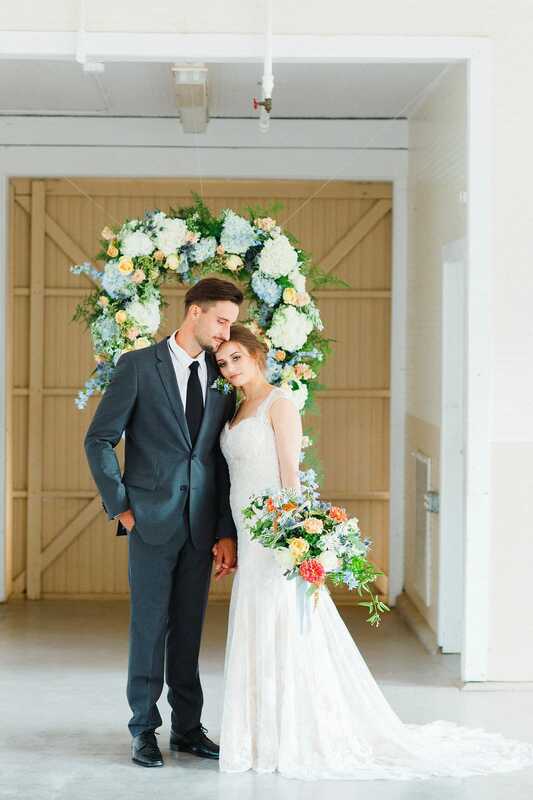 Amanda recently joined with amazing photographer Julia Fay Photography to create a southern wedding inspired styled shoot at the Dairy Barn at Anne Springs Greenway. 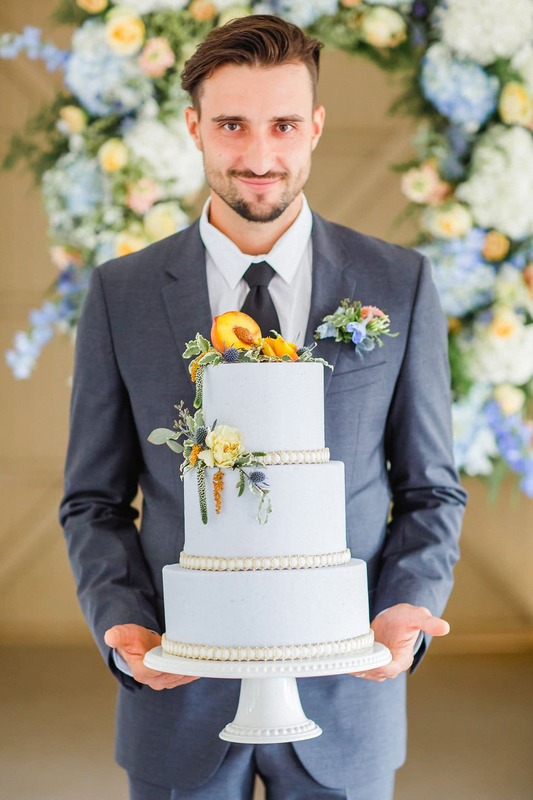 And lucky for us, they brought in the floral designer, Jimmy Blooms Floral to help make everything magical. 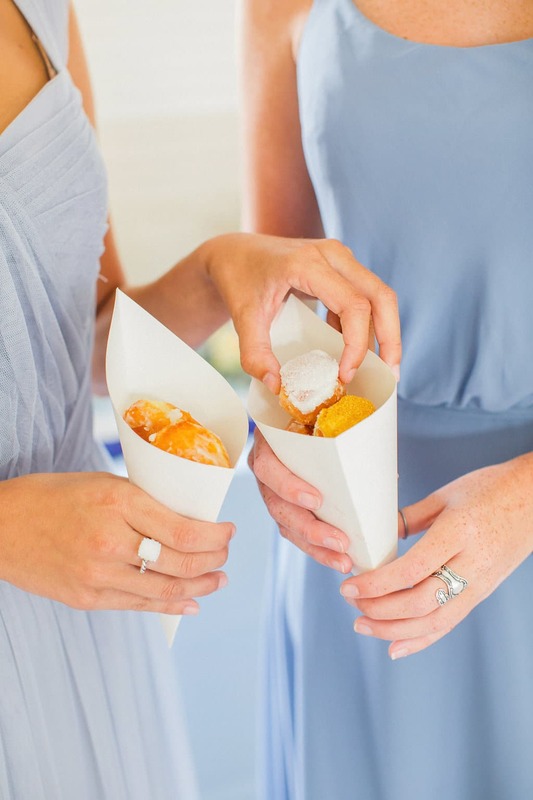 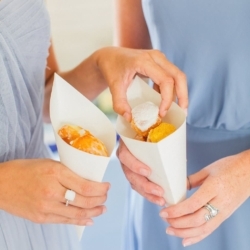 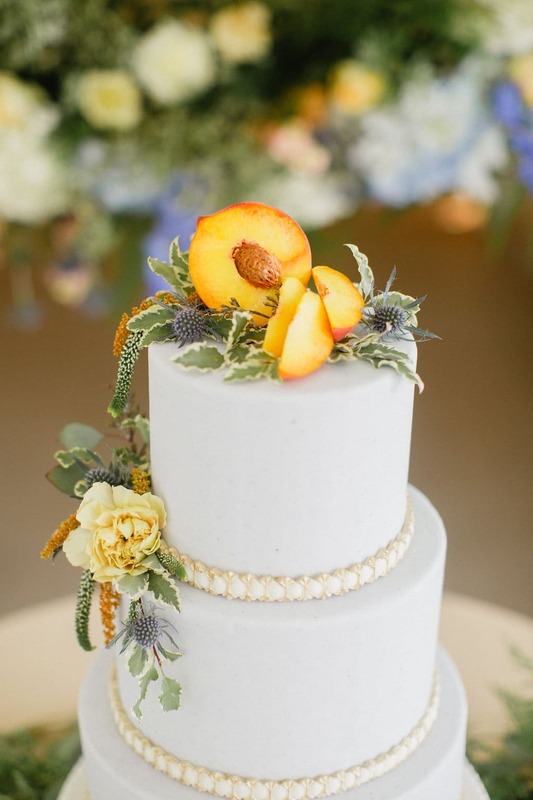 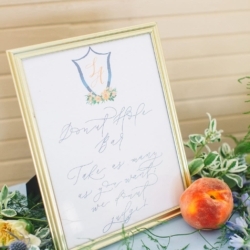 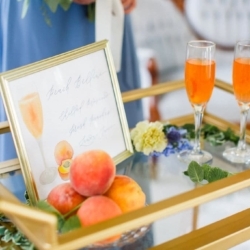 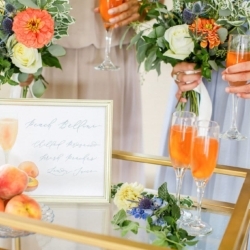 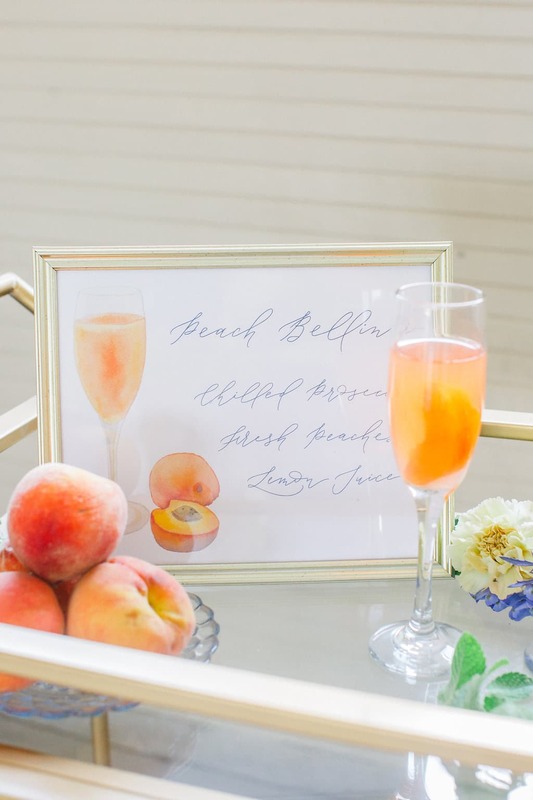 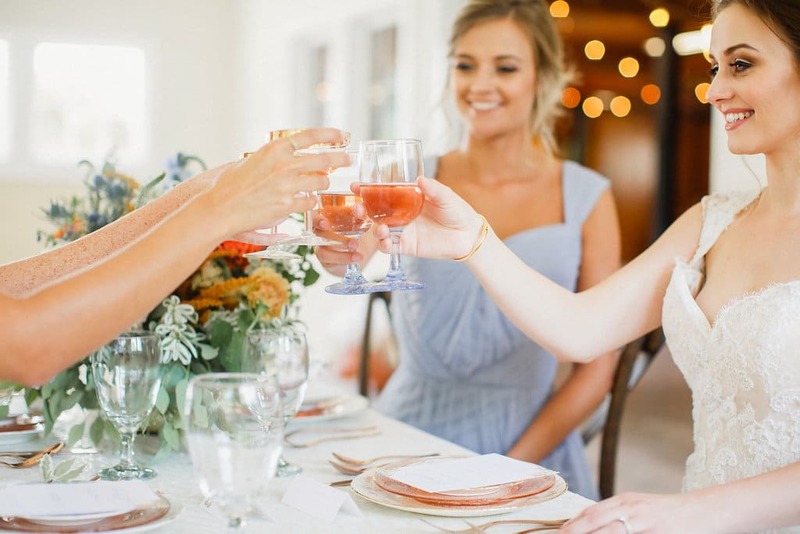 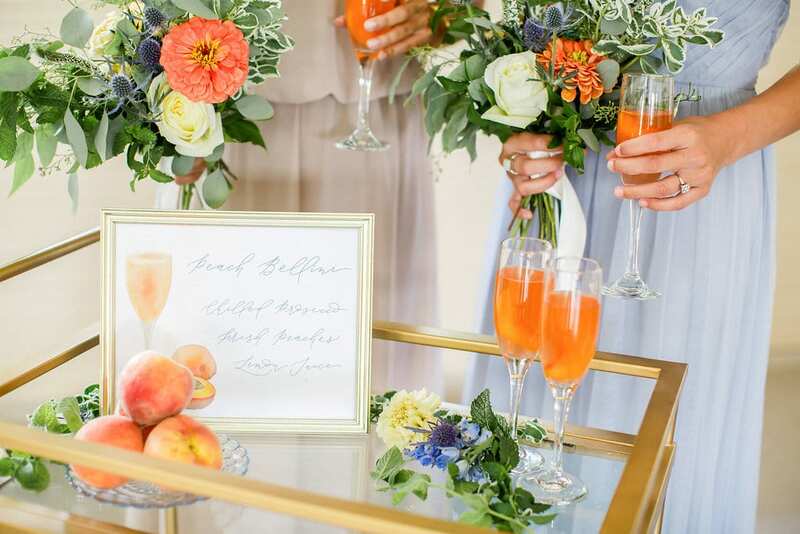 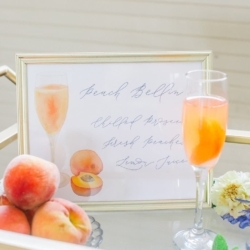 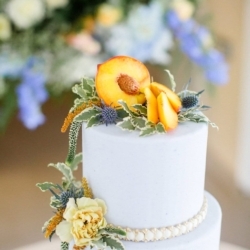 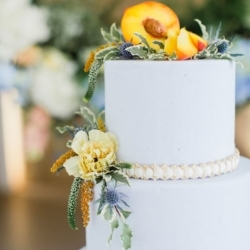 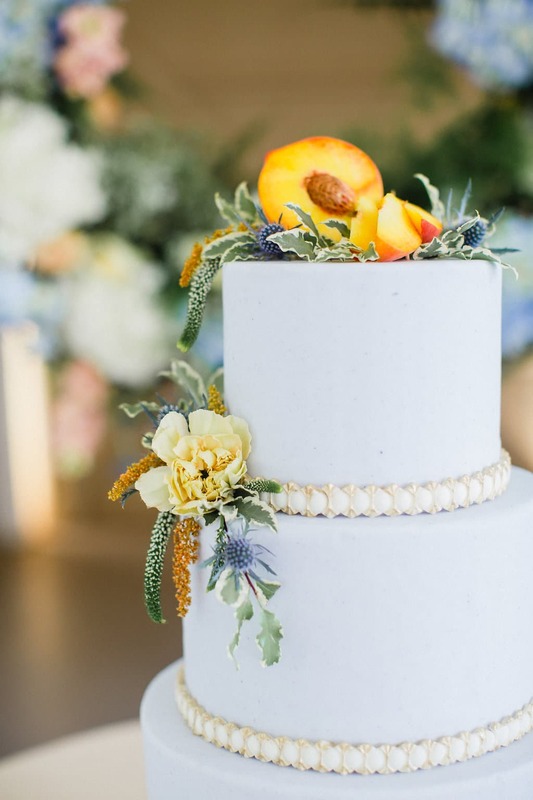 It’s no secret that things can get pretty hot in the south, but this sweltering heat can sometimes have sweet results and in the case of this dreamy wedding, they come in the form of sweet peaches. 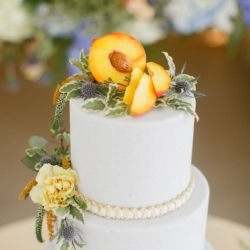 Peaches are grown in the area around the Dairy Barn, so they are a staple to the locals. 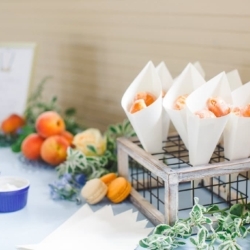 These fresh peaches were paired with soft blue hues to create a pretty palette that would make any southern lady swoon. 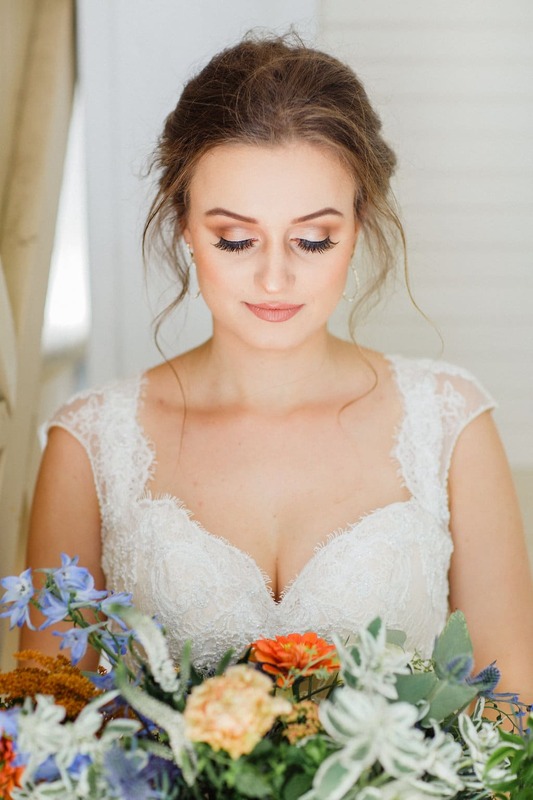 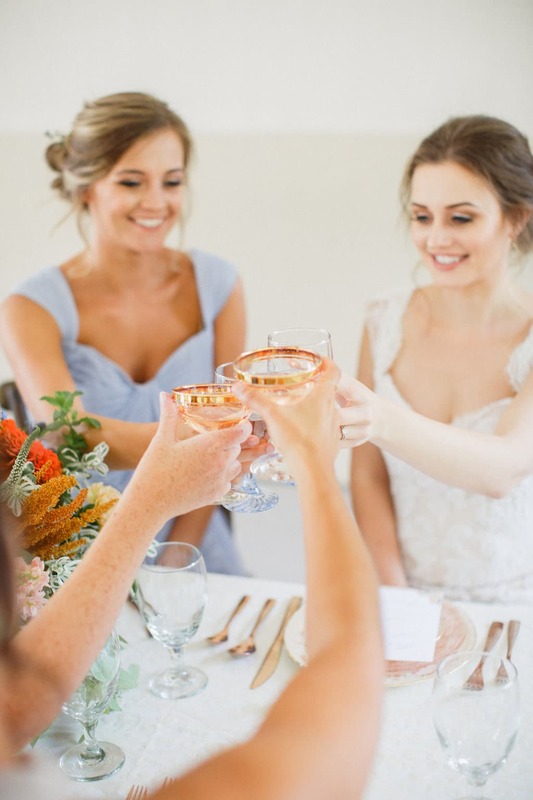 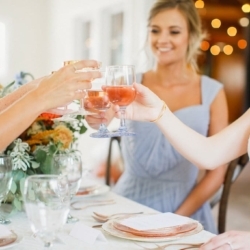 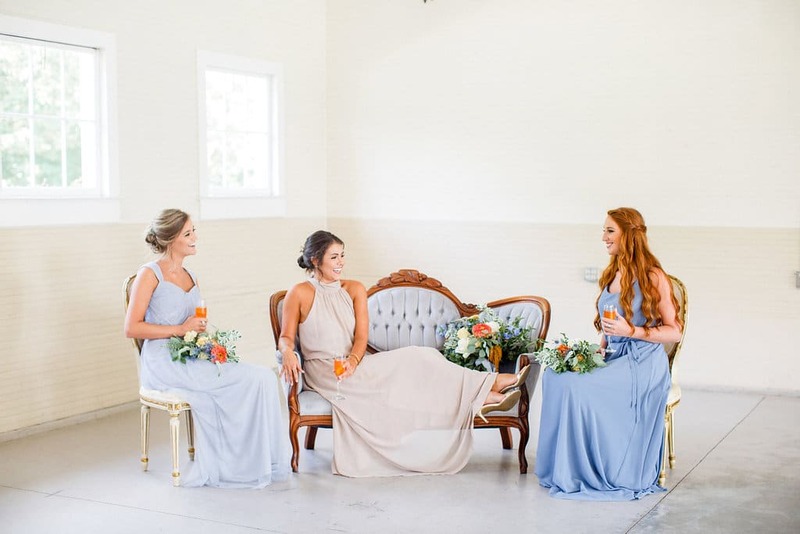 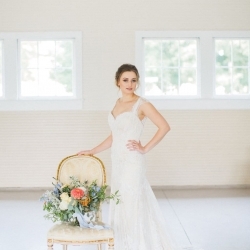 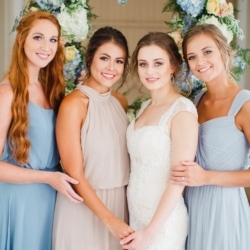 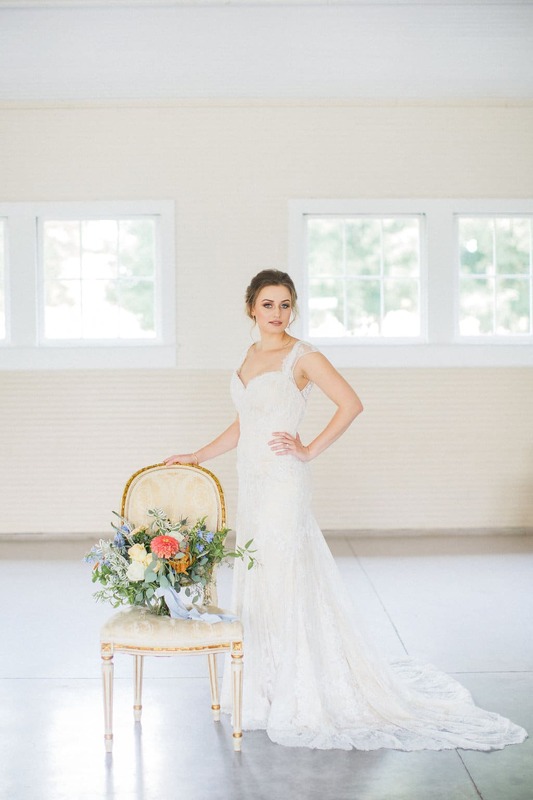 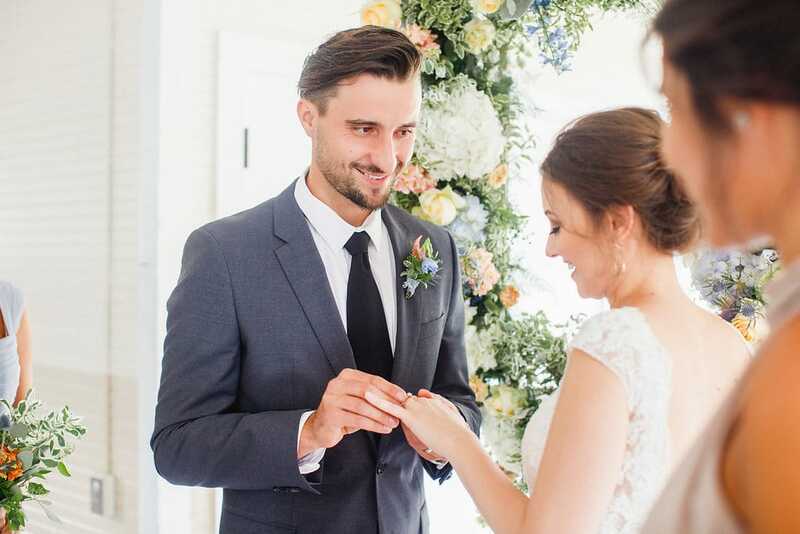 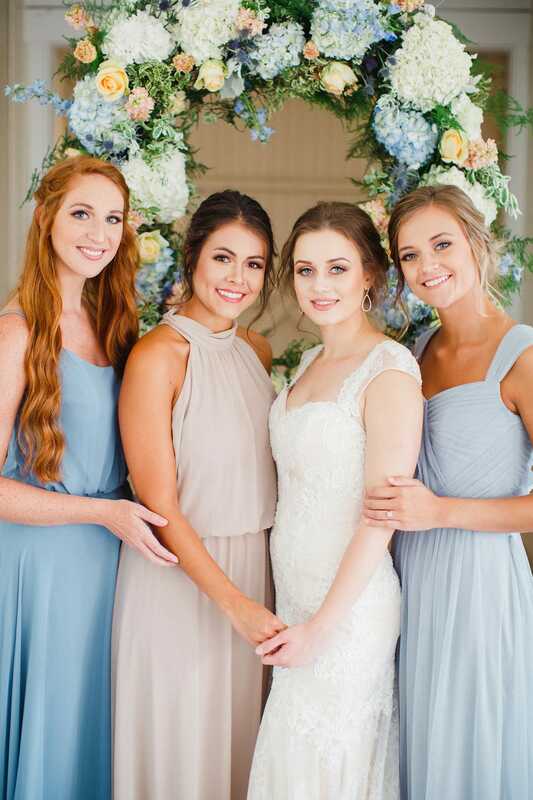 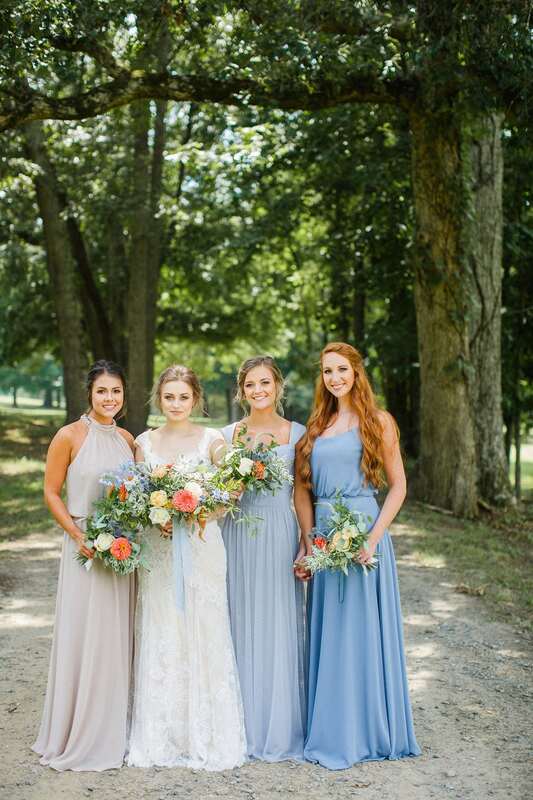 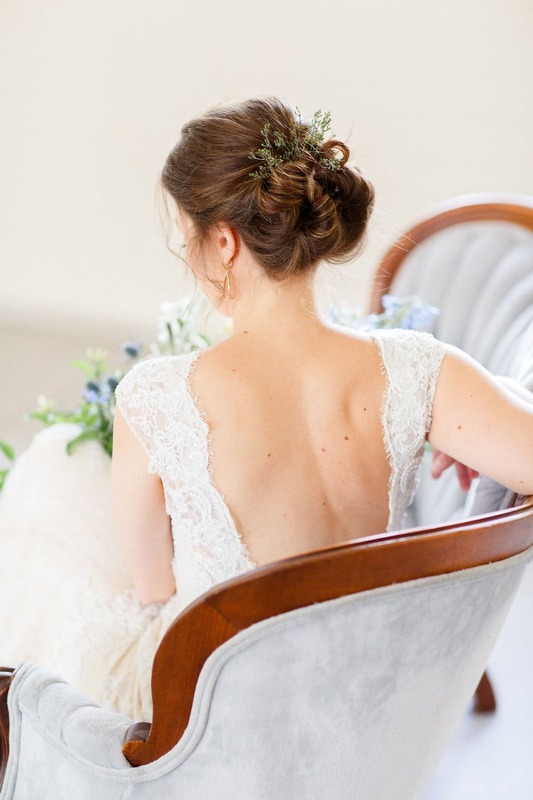 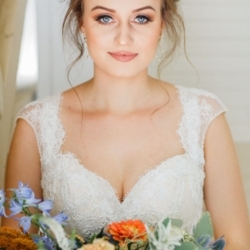 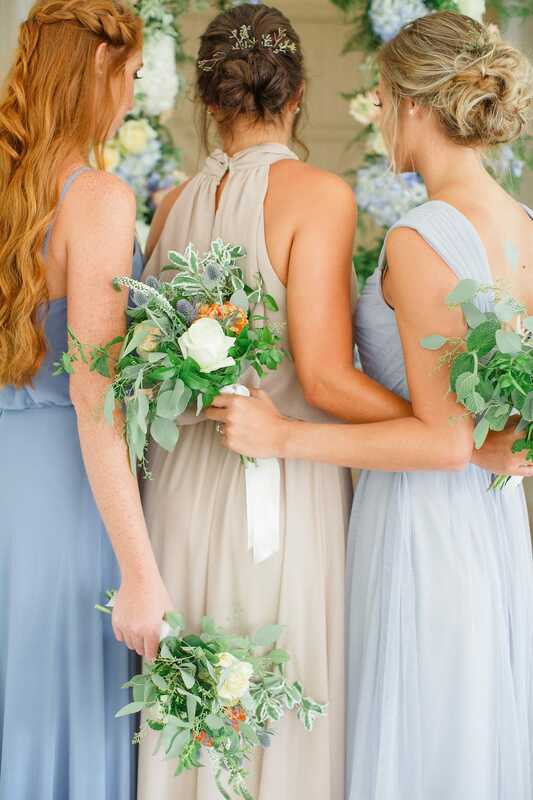 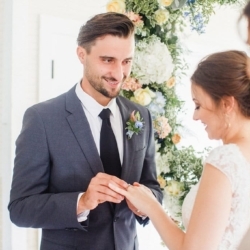 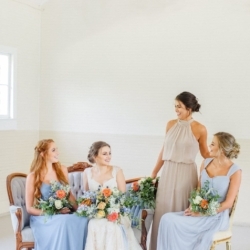 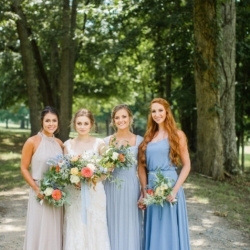 The dresses and hair and makeup provided by Simpson’s Bridal and Reagan were the perfect sweet combination to truly show how southerners dress up any event. 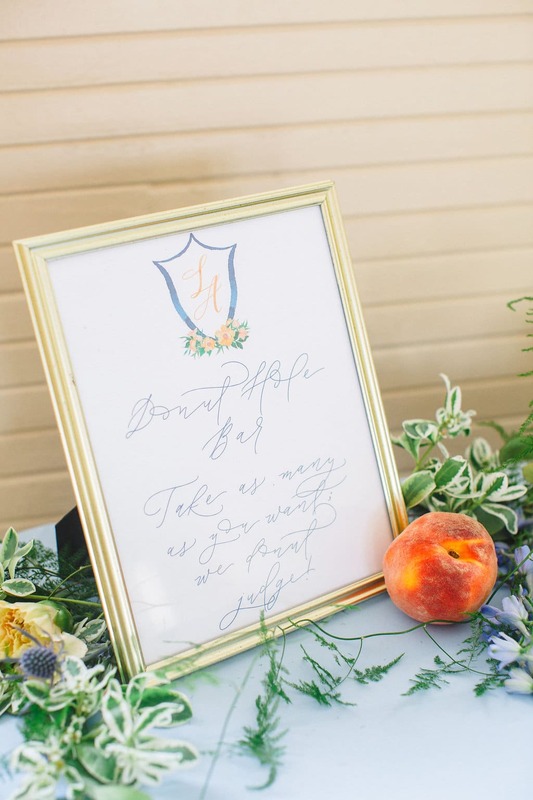 Mixing in a classic design with modern elements, this styled shoot shows you really can have the best of both worlds. 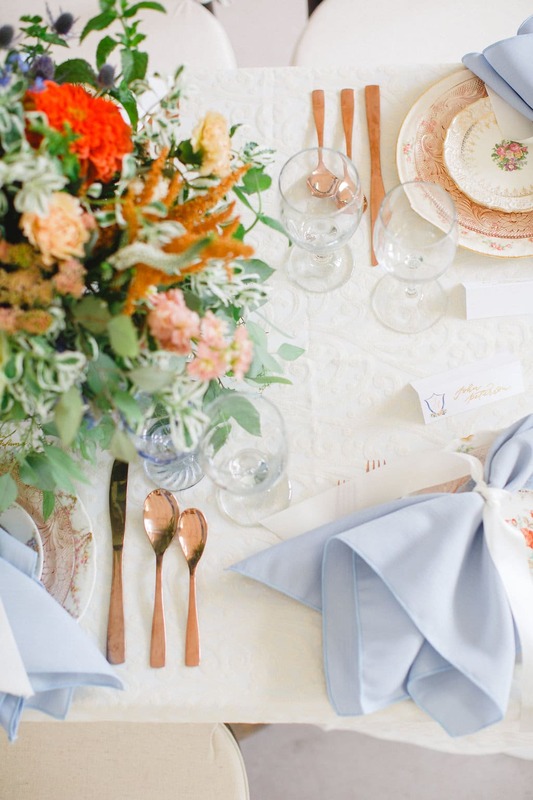 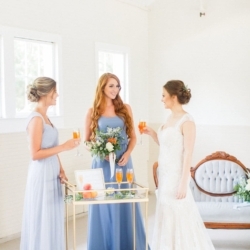 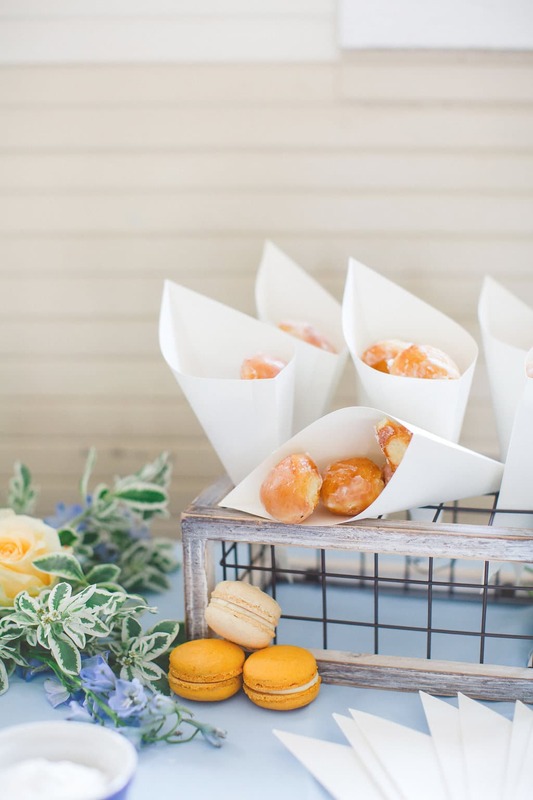 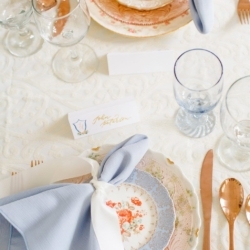 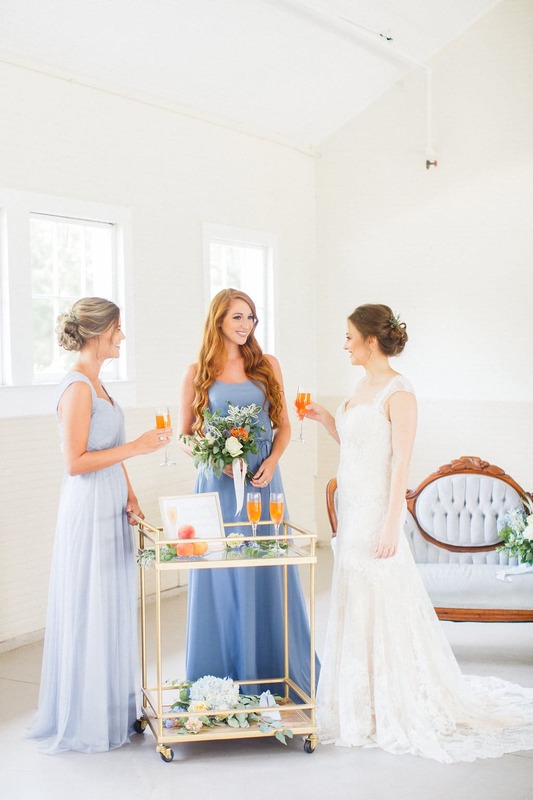 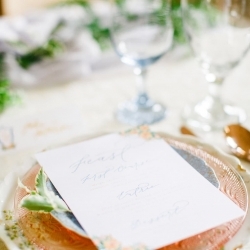 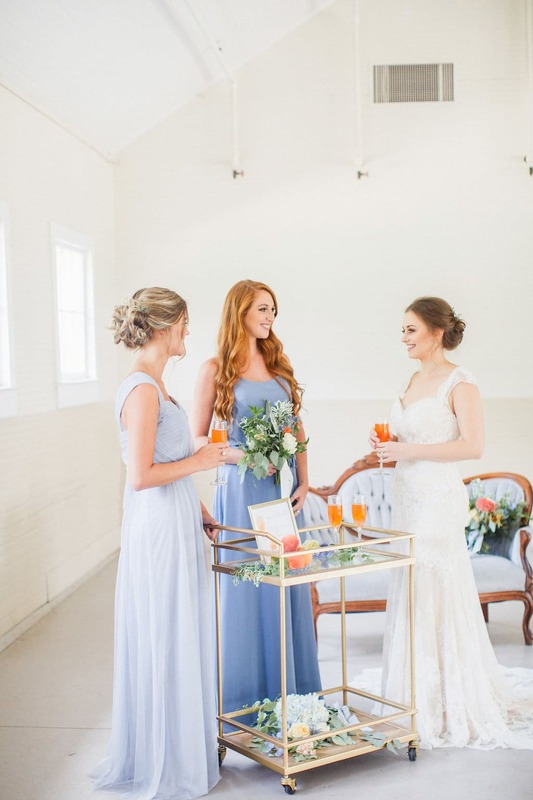 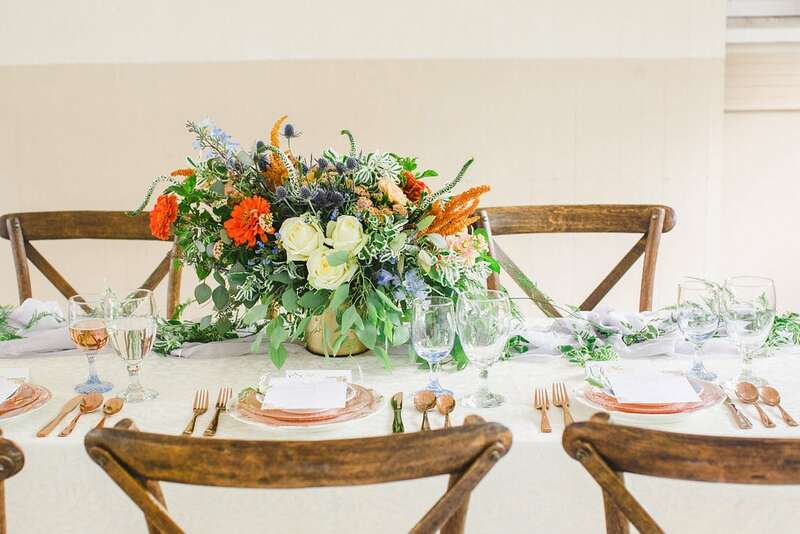 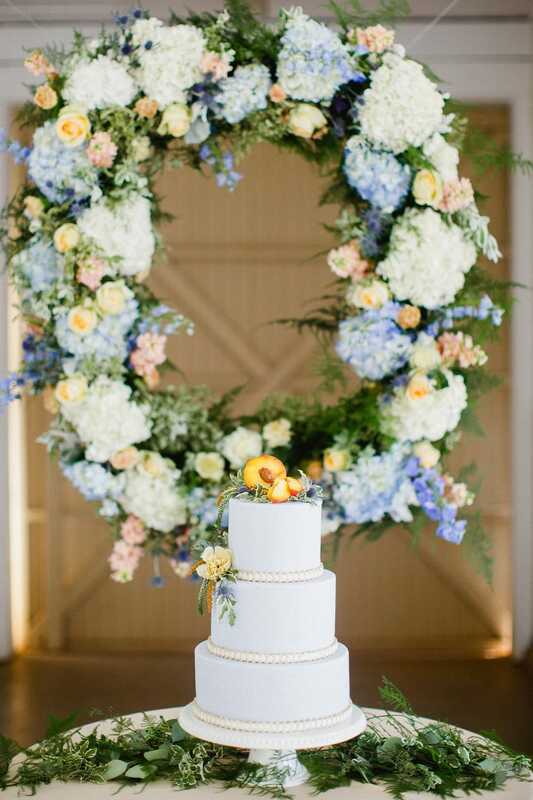 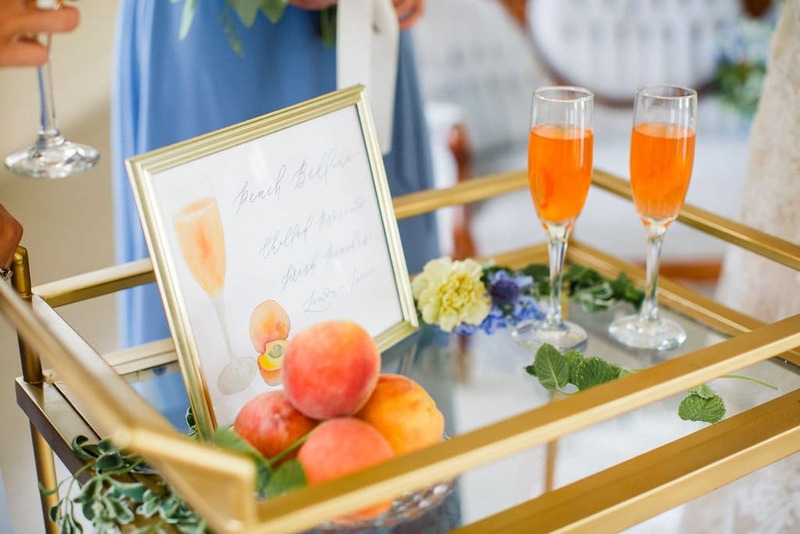 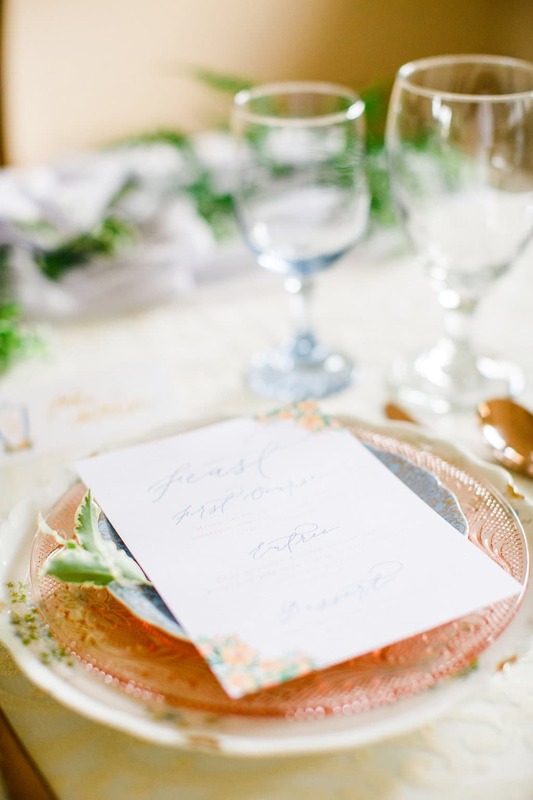 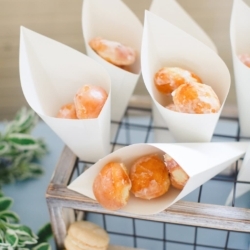 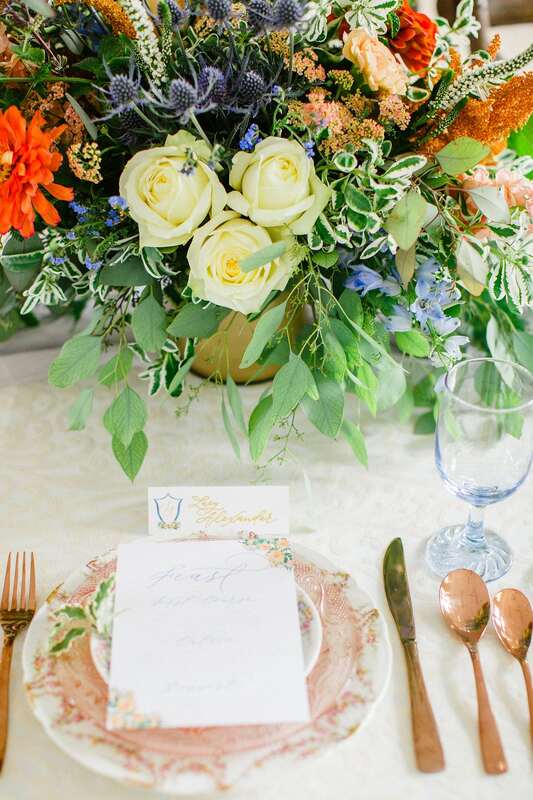 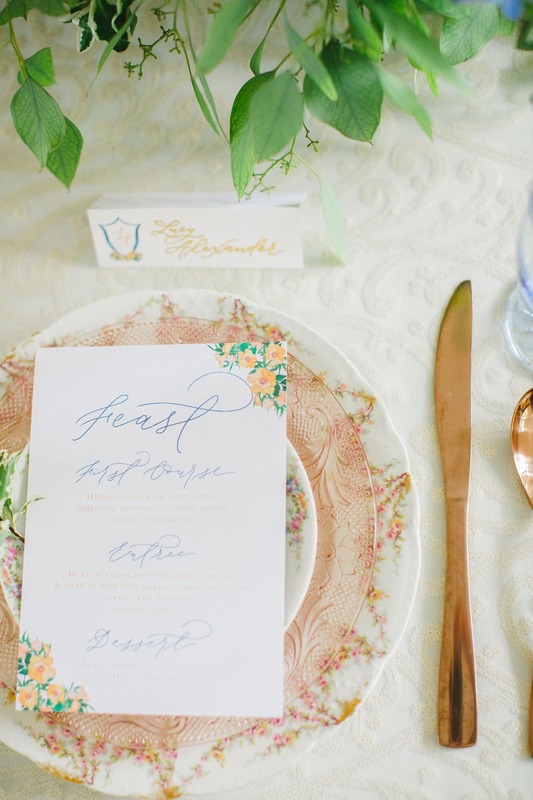 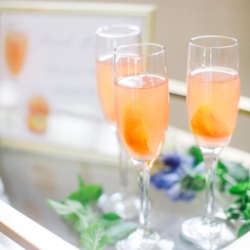 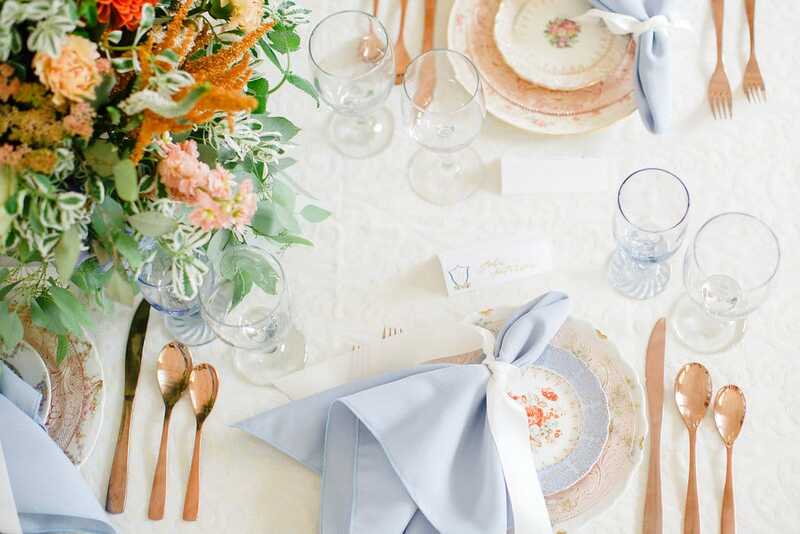 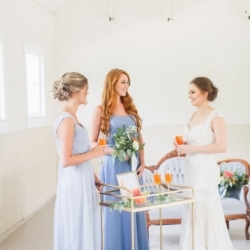 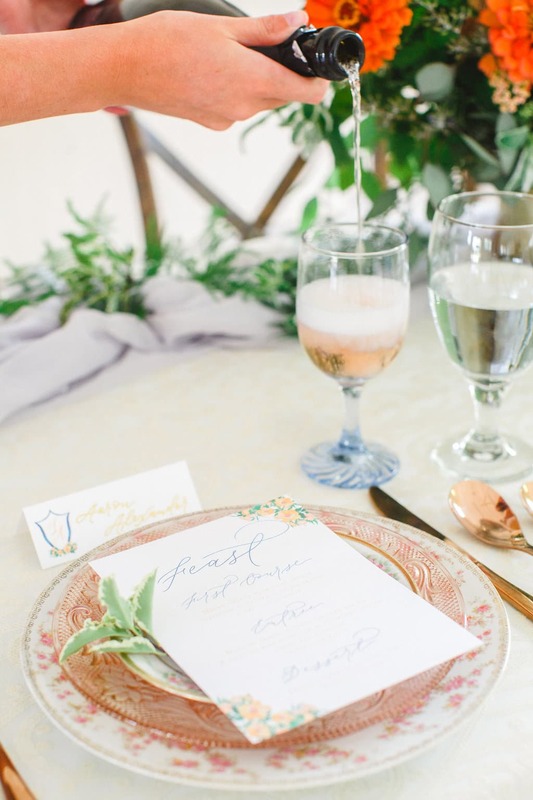 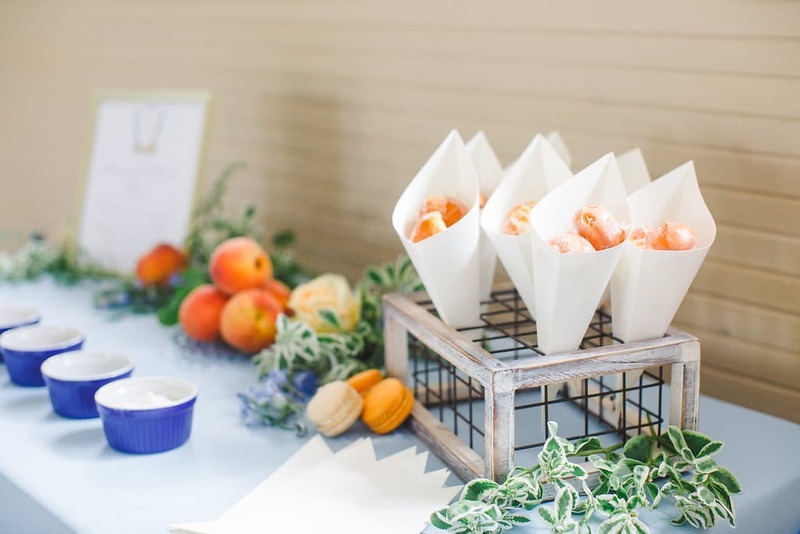 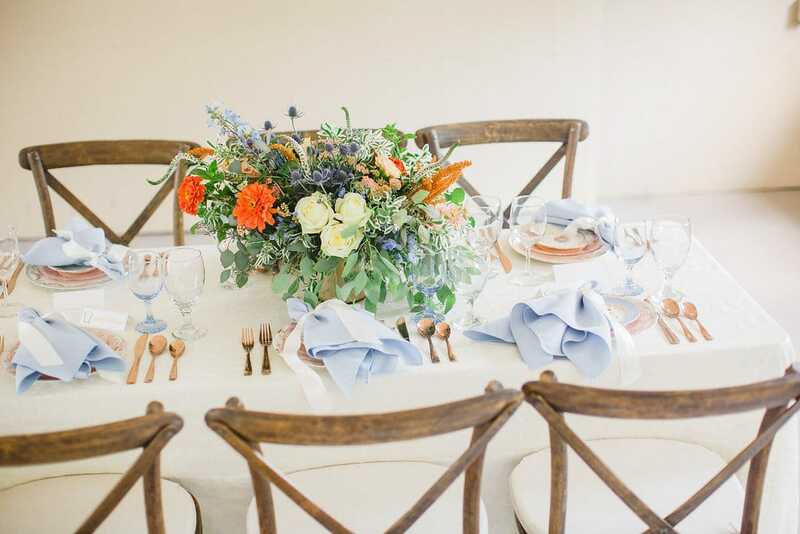 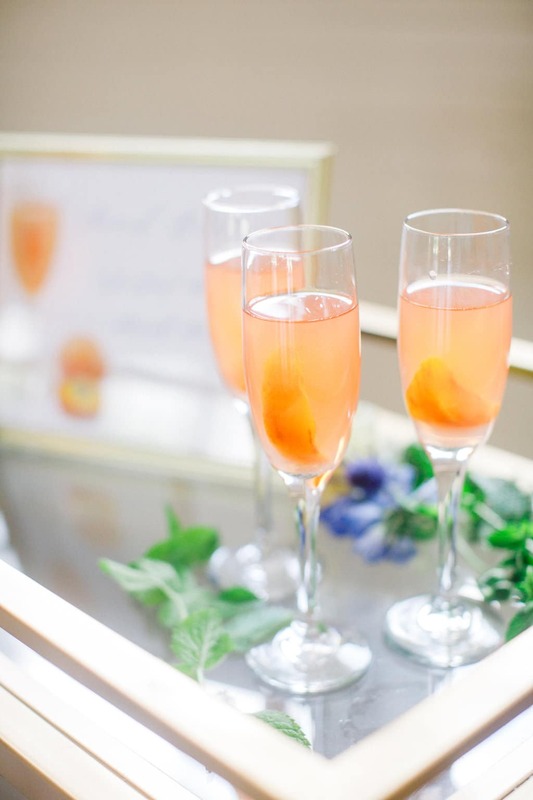 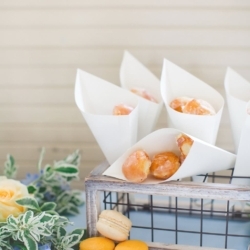 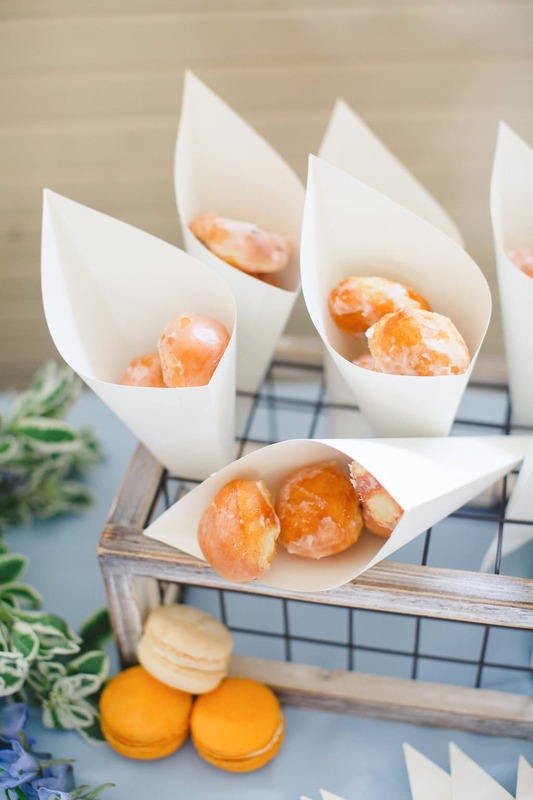 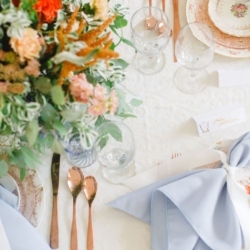 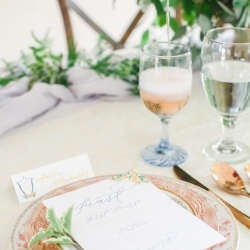 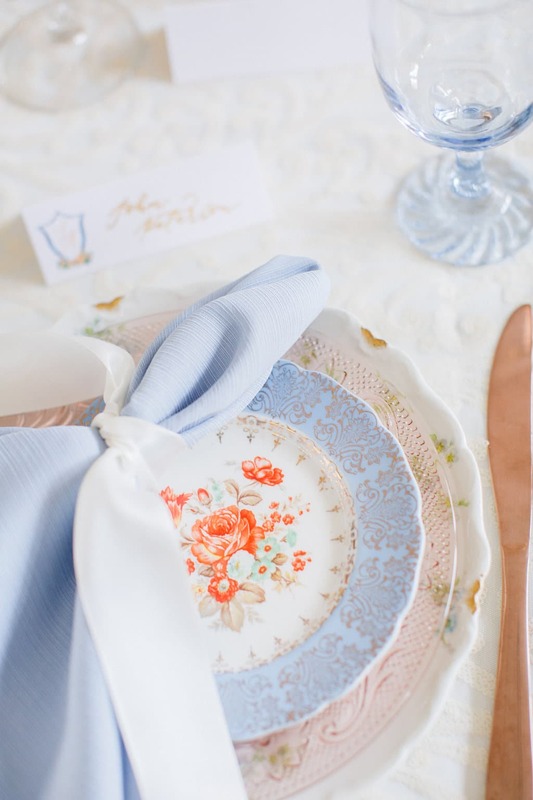 Vintage peach and blue china from Evermore Event Rentals and tables and chairs from Creative Solutions Special Events showed deep southern roots, while a streamlined gold bar cart and doughnut hole desserts showed off a more modern touch. 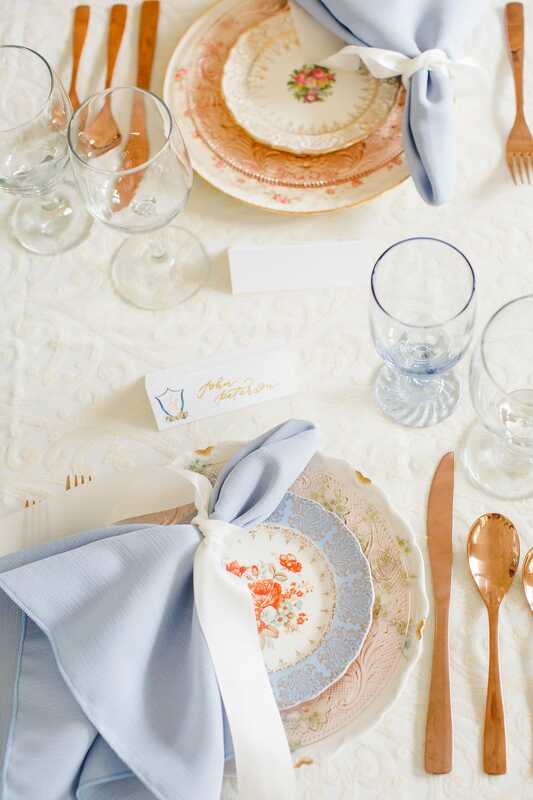 The luxurious linens from BBJ Linen provided the perfect color choices as the backdrop to the tablescape. 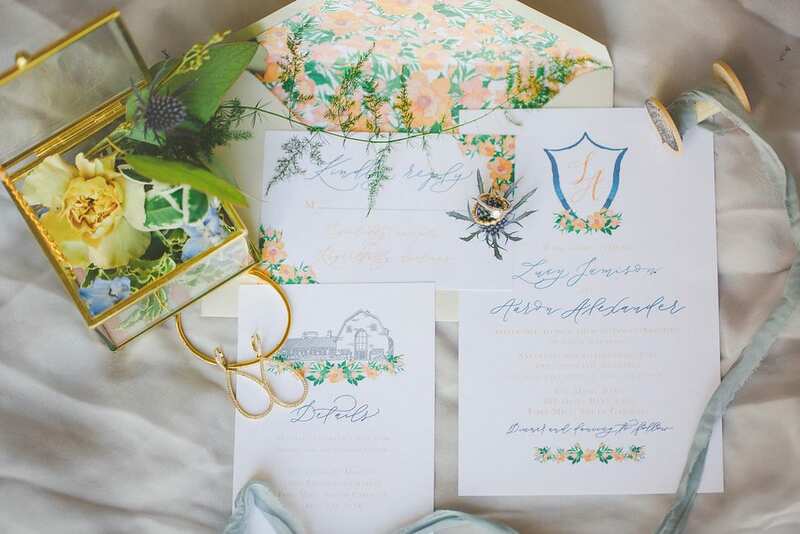 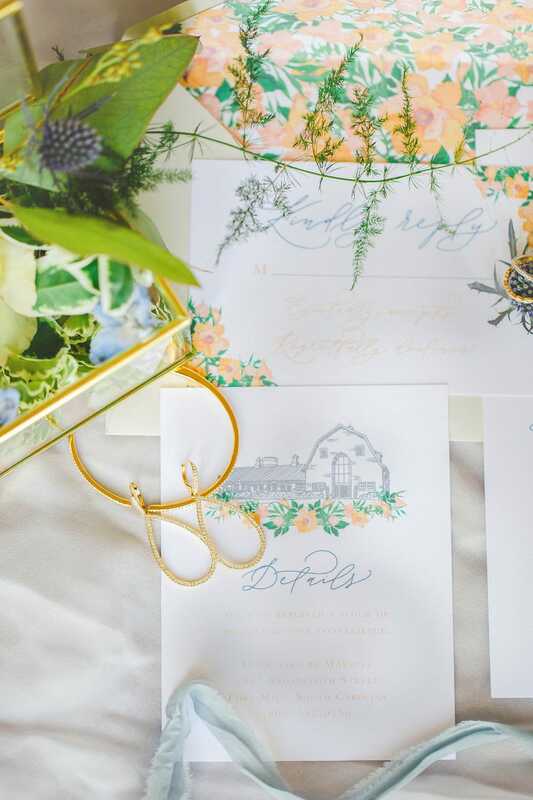 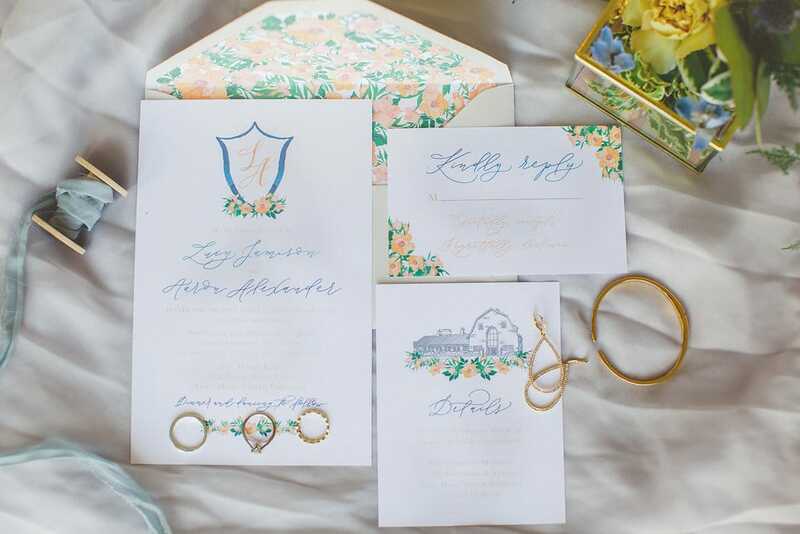 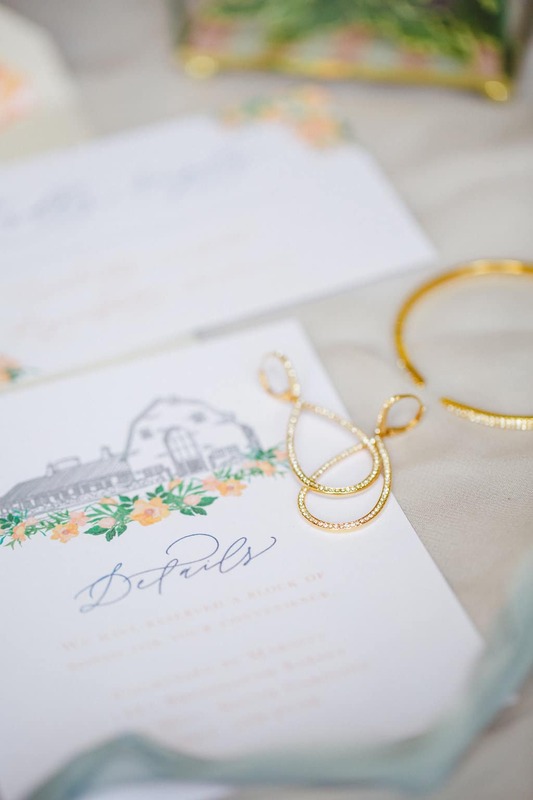 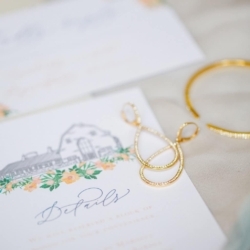 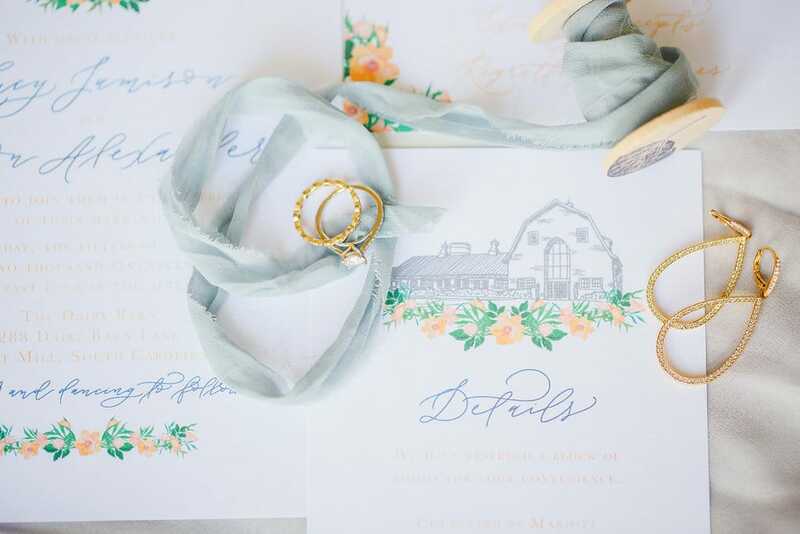 A delicate wedding invitation suite designed by Ocean and Coral Creative (along with the gorgeous calligraphy throughout) displays an amazing rendering of the venue’s iconic Dairy Barn, giving guests a glimpse of the beauty this event is sure to have in store. 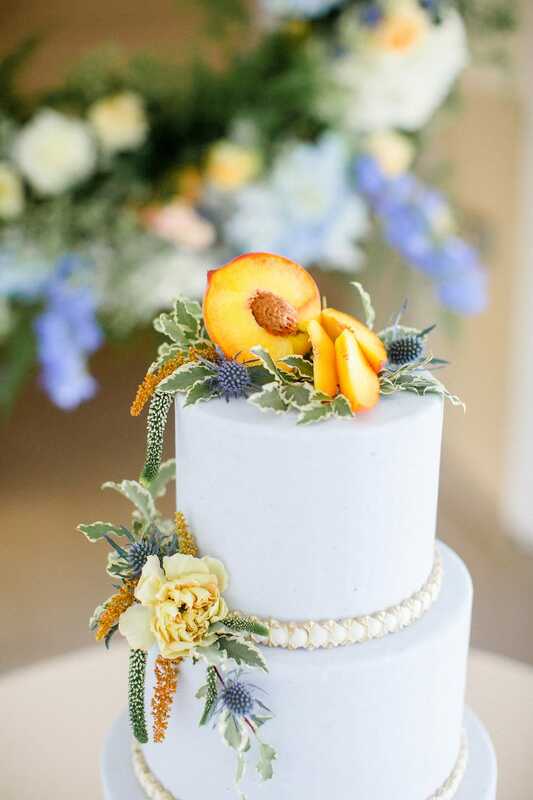 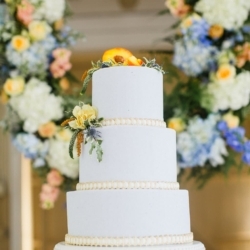 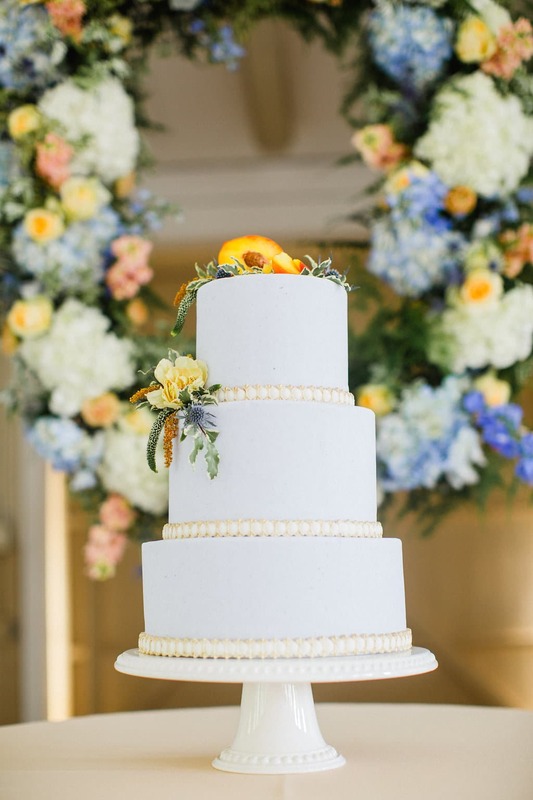 And the amazing cake designed by Sky’s the Limit Cakes features classic pearl detailing topped off with what else, but a fresh southern peach! 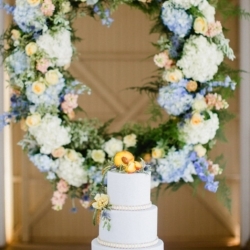 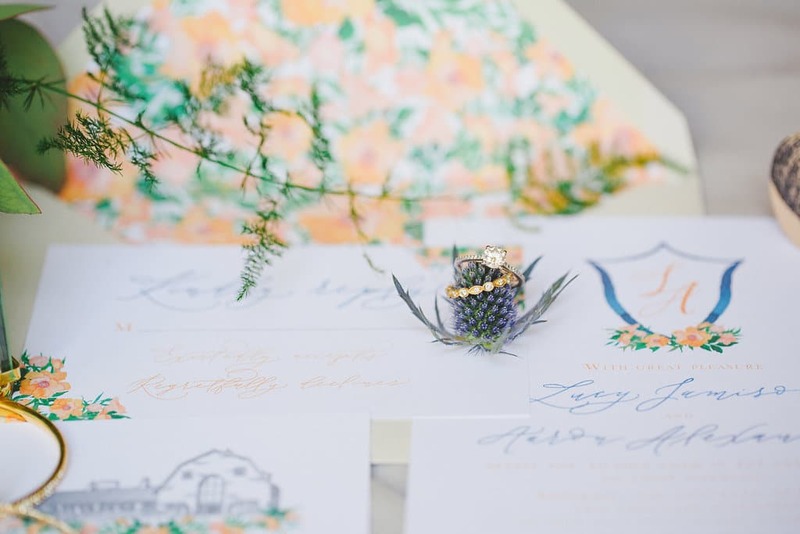 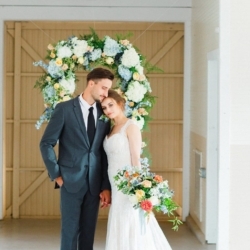 To top it off the entire design was brought together with stunning florals by Jimmy Blooms. 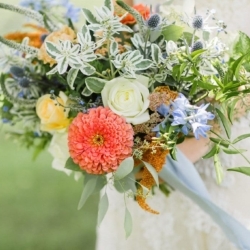 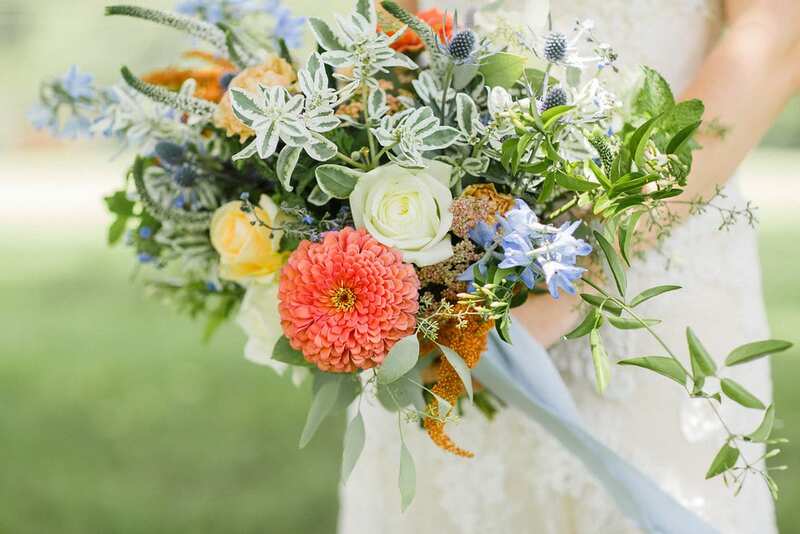 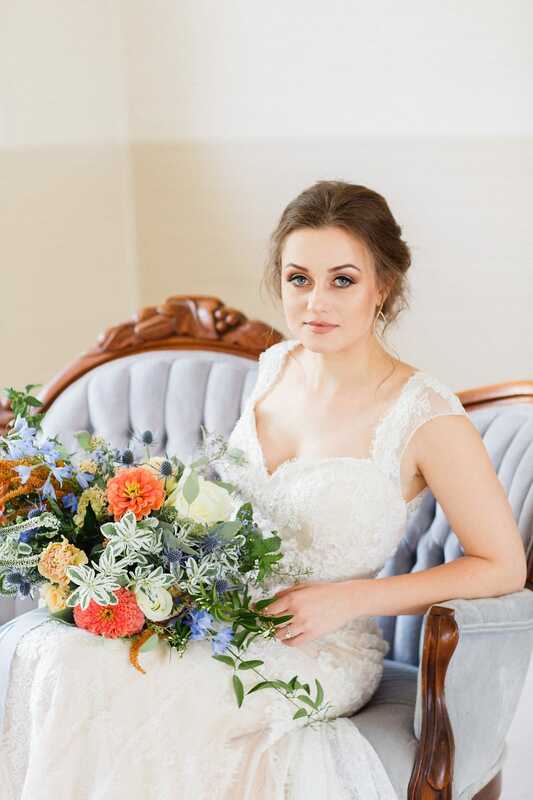 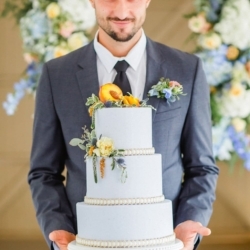 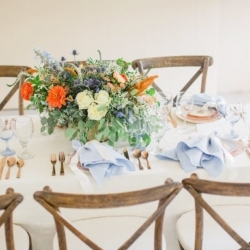 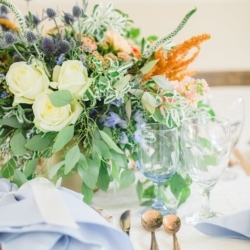 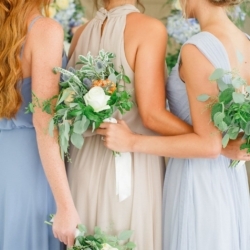 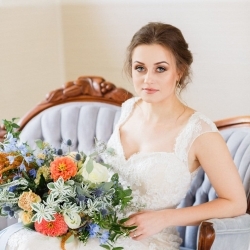 The bridal bouquet is truly a work of art showing off an amazing selection of peach and blue toned florals. 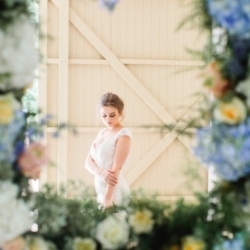 Plus the addition of a gorgeous hanging floral frame created the perfect backdrop for amazing bridal party portraits. 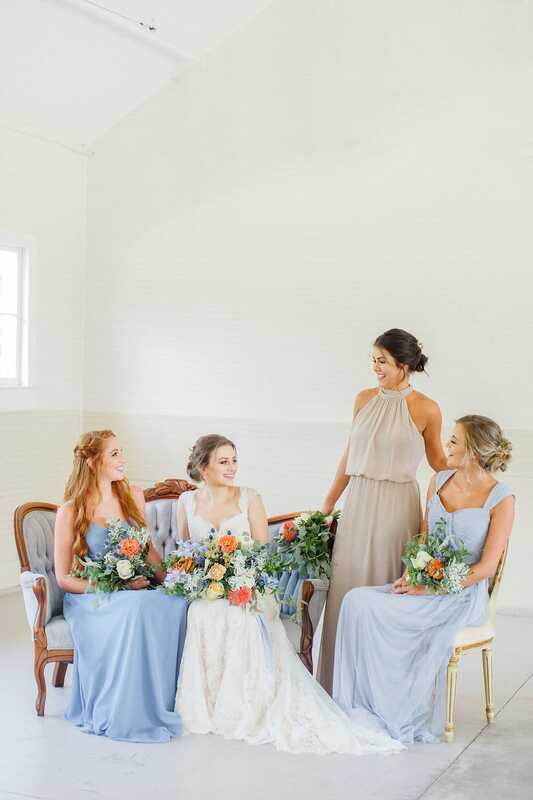 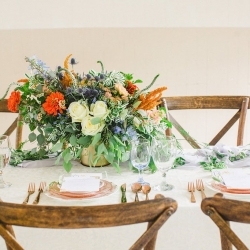 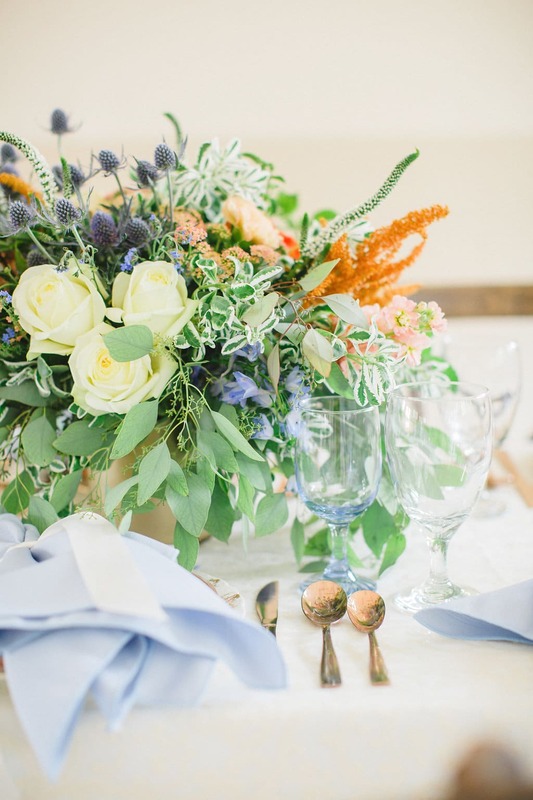 With its stunning design and swoon-worthy color combination, it is no wonder this breathtaking style shoot was featured on The Perfect Palette. 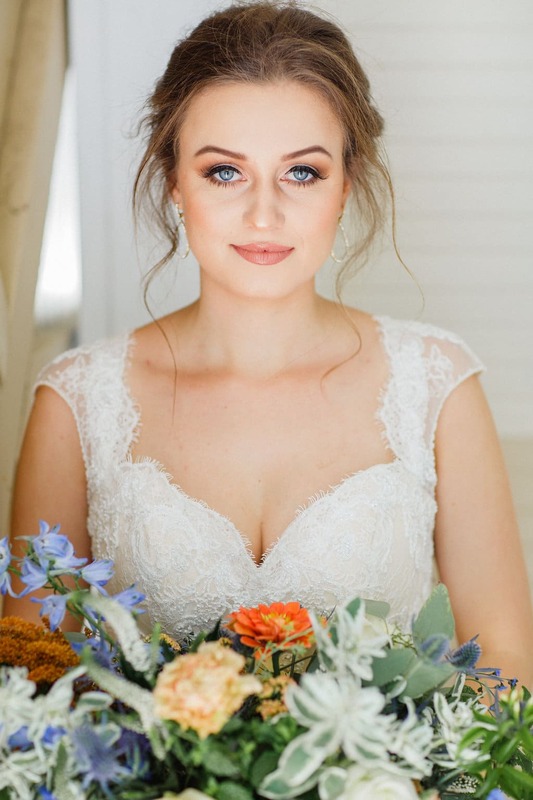 Congrats Amanda on a job well done! 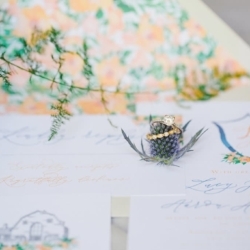 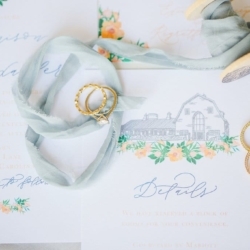 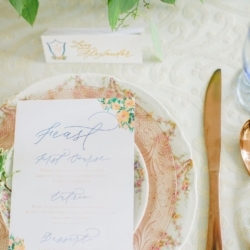 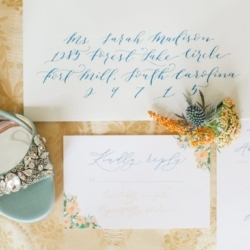 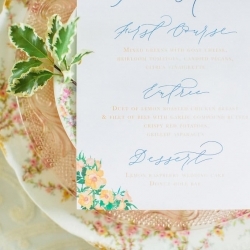 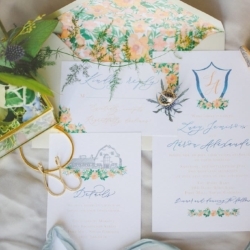 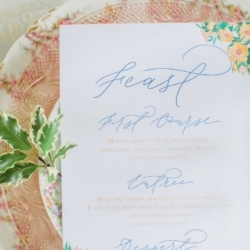 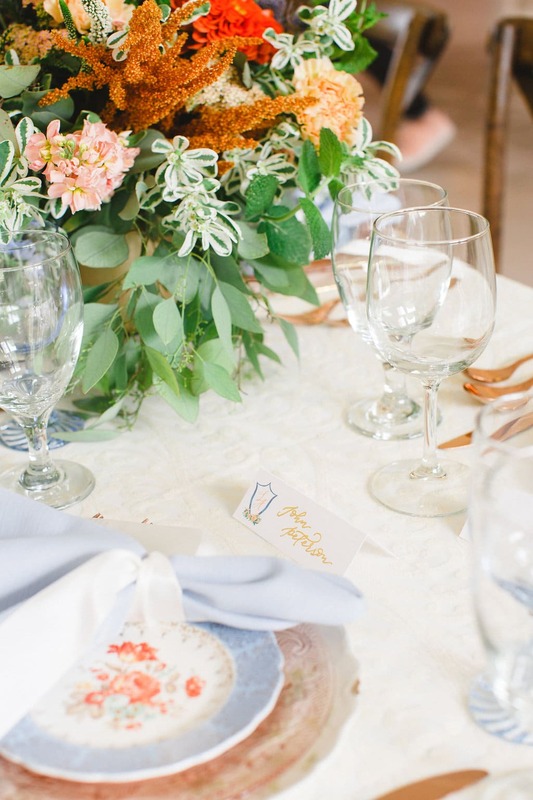 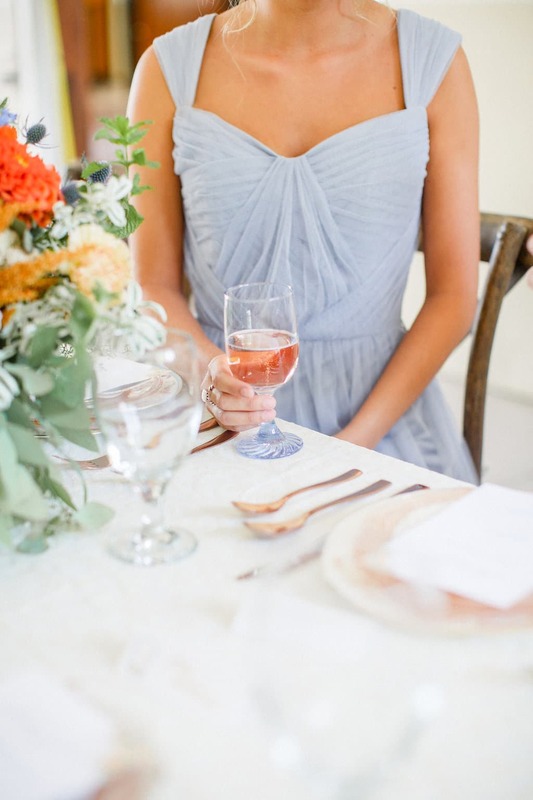 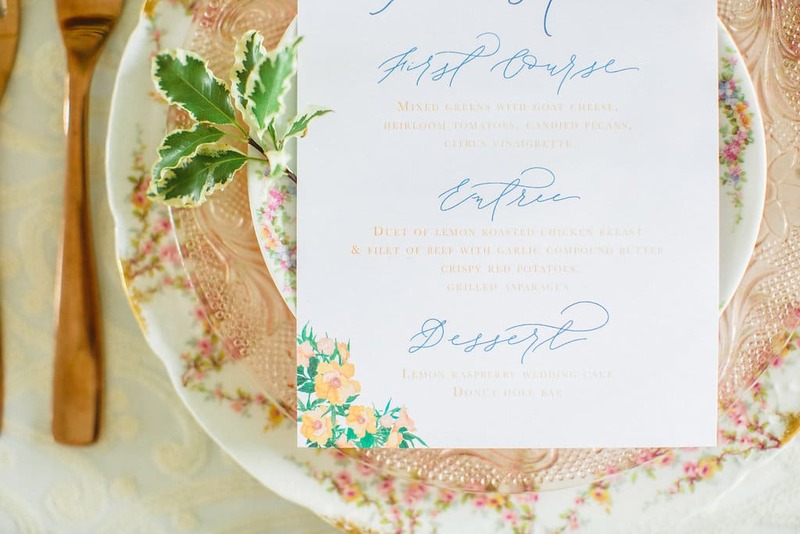 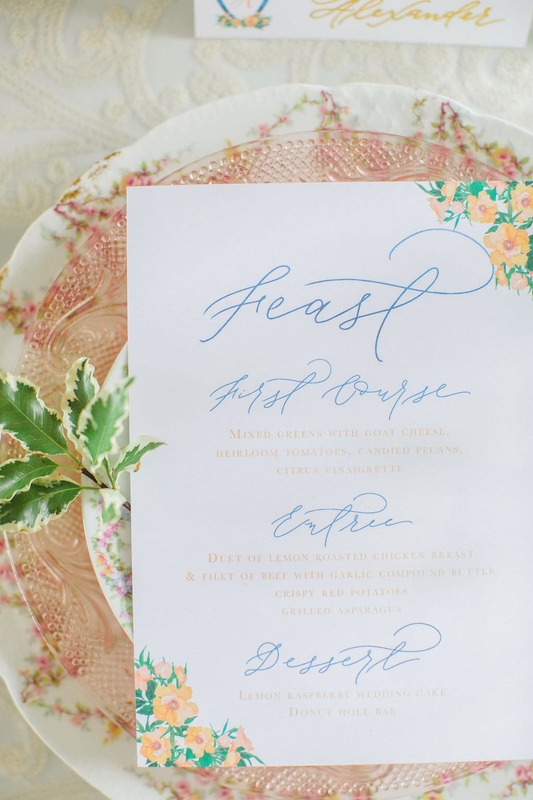 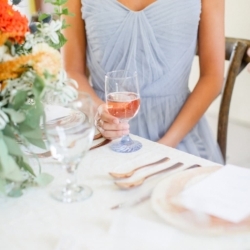 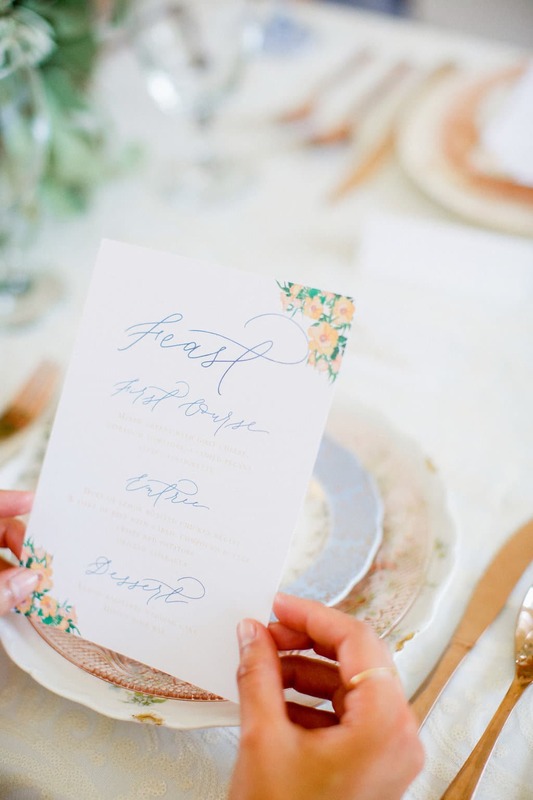 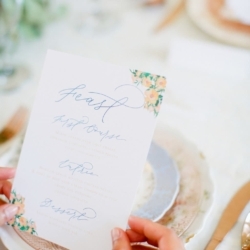 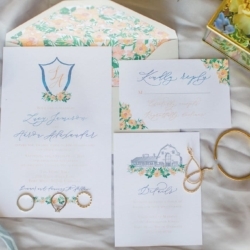 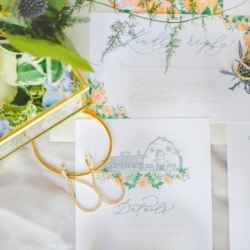 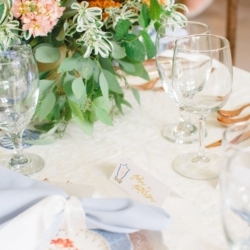 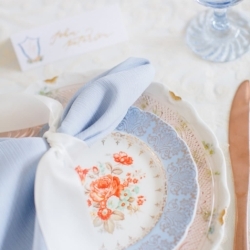 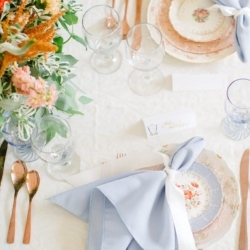 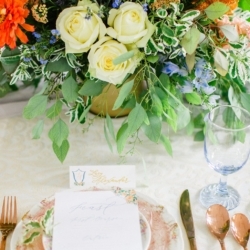 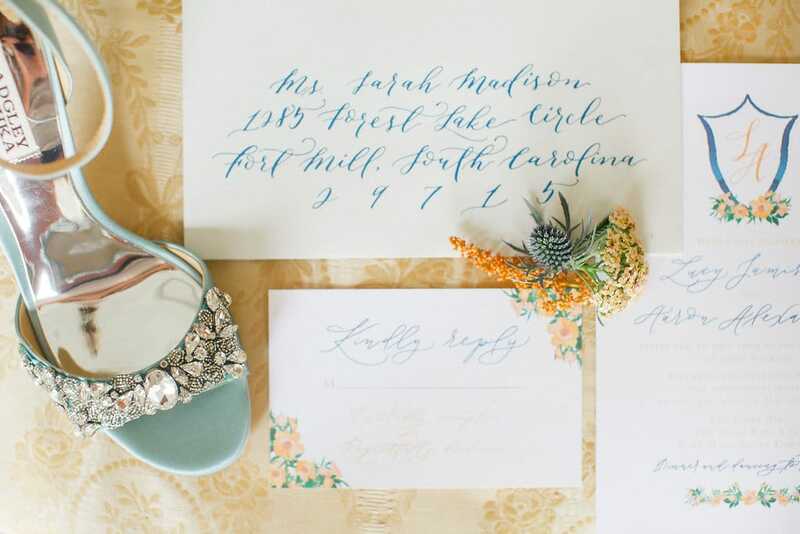 Want help designing your own southern affair to remember? 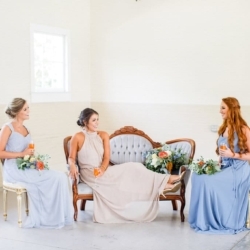 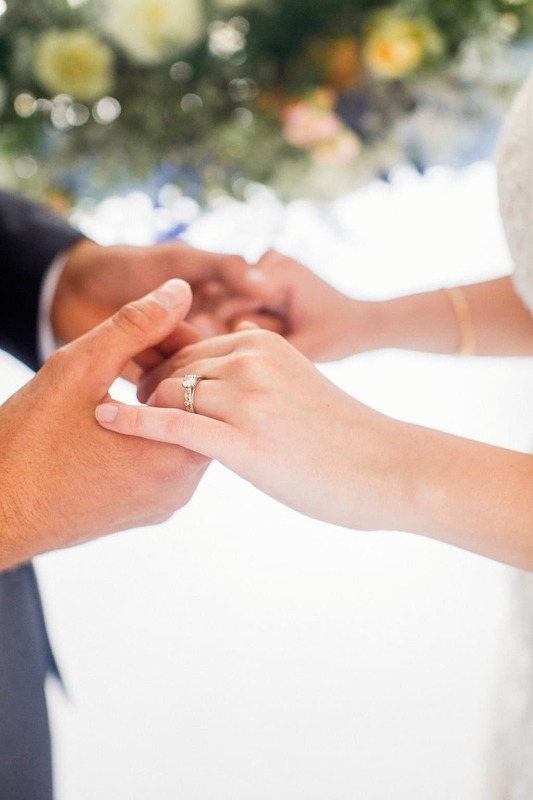 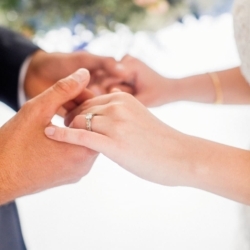 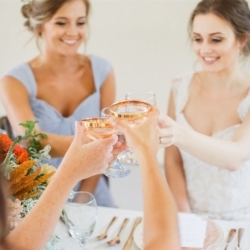 Contact us at Magnificent Moments Weddings – we would love to design the perfect event for you!